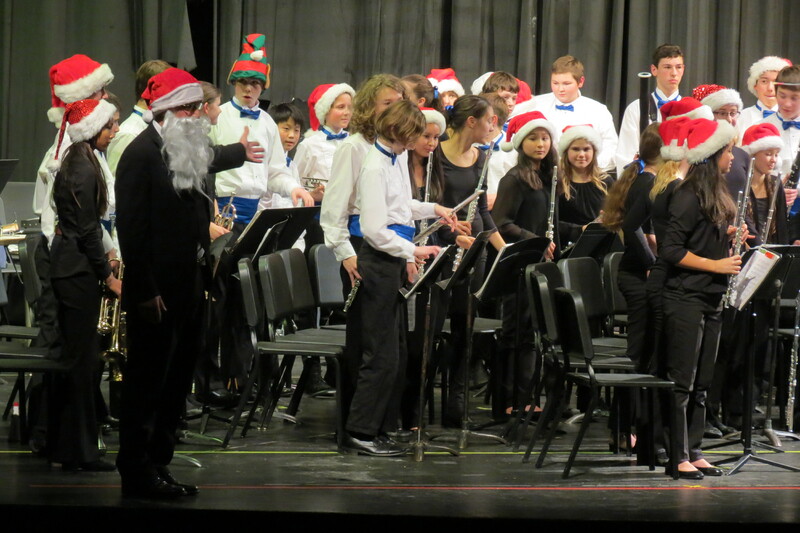 One of the outstanding music programs in Seattle did it again—four Hamilton International Middle School bands gave a great “Winter All Bands Concert” at Lincoln High School Auditorium on 11 December 2014. Beginning with the 66-member Concert Band, some soloists and an ensemble started to emerge from the two remaining bands. The ensemble was featured in “Drums A-Plenty,” arranged by Lew Pollack. And finally, when the 70-member Symphonic Band took the stage, the spotlight fell on an accomplished xylophone soloist, playing “Galop” by Dimitri Kabalevsky. A gallery of photos of the four bands follows (below). Please click on any photo to enlarge it. This entry was posted on April 27, 2015 at 6:46 pm	and is filed under School Concerts. Tagged: Angela Babbitt, bands, concert, Dan Rowe, drums, ensemble, FOMAHI, Hamilton International Middle School, Leroy Anderson, Sleigh Ride, soloists, symphonic, trumpet, trumpeters, xylophone. You can follow any responses to this entry through the RSS 2.0 feed. You can leave a response, or trackback from your own site.